Marriage Meeting Program workshop for couples; Marry With Confidence workshop for singles; Positive Communication Skills programs; Customized presentations for groups and organizations; Continuing education classes for therapists and counselors. Making your initial psychotherapy appointment can feel daunting. Likewise when it comes to choosing a therapist. Choose wisely, with the information that follows as a guide. “There are three things extremely hard: steel, a diamond, and to know one's self,” said Ben Franklin. It's natural to hold on to a romantic view of ourselves or to just see ourselves as other people define us. Self-understanding is a lifelong challenge. It brings countless rewards in relationships you value and in realizing your dreams. Therapy helps you to be as honest as possible with yourself in a climate of understanding, compassion and acceptance. Q: Are Marriage Meetings good for everyone? 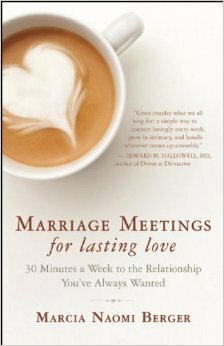 A: Marriage Meetings are for healthy couples who believe their relationship can get better, or even better. More Q & A on this video. If your partner tells you, “We have a problem,” does your chest tighten? Do you forget to breathe? Do you jump to the conclusion that something is terribly wrong with the two of you as a couple, so wrong that it may be impossible to fix?